Hay! Now that you hoofed it over here, have you herd of Battle Cattle? 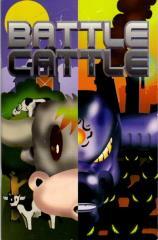 If not, get ready to make patties of your opponents with Battle Cattle: Second Edition! This time the shoe is on the other hoof. Now that other bovines are pasture experience level, you need new devices, new cows and new means to butcher your enemies. Make haste to prevent your udder destruction!